Groundwater is the major resource for the survival of living beings or any other living organisms. This water system provides a perfect cycle for water restoration. But, due to human activities, water is being over exploited and contaminated in everyday possible. This contamination results in decrease in water quality, turbidity may increase and moreover, these waters can become unstable to sustain any aquatic life . From the analysis, it was found that about half of the world population was groundwater for drinking purposes. This is because of various reasons such as increasing urbanization, industrialization and mainly population growth. The groundwater pollution in Cuddalore is mainly because of industrialization of SIPCOT Industries. The effluent release from those industries has increased the contamination in groundwater due to its penetration through the soil. This contamination has leaded to increase in water-borne diseases. The values obtained by this analysis were studied and compared with the observed value of BIS, which tells us about the permissible limit of water for better use of water [2-5]. The latitude and longitude of SIPCOT is 11.69658°N and 79.75682°E. From the study conducted by Stanley Associates and executed by Tamilnadu Pollution Control Board, the pollution load in Cuddalore SIPCOT region is extremely high. This results in travel of pollutants downstream to the various water bodies. Many problems in crop production such as poor germination, poor grain formation and low-quality output are obtained. From the reference of The Hindu, the coconut water in Cuddalore has turned tasteless and if consumed excessively health problem may arise . Many cases have been reported due to water toxicity by groundwater which led to many diseases like typhoid, flu, viral fever etc. more than 40% wells are affected by the contaminated water which directly affects all the life forms. Cuddalore district is located approximately 23 kilometers from Puducherry. During pre-monsoon seasons (August 2016-December 2016), five samples were taken from five different places every month (Figure. 1). Cuddalore district is located at latitude of 11°45? N, longitude of 79°45? E and altitude of 6 meters (20 feet). This district is famous for Shiva and Vaishnava temples (Table 1). These samples are collected in small polythene bottles of 200 ml and cleaned by acid water, followed by rinsing with distilled water. Samples were analyzed to determine pH, total dissolved solid (TDS), electrical conductivity (EC), chlorides, hardness test in the chemistry laboratory (Figure. 2). 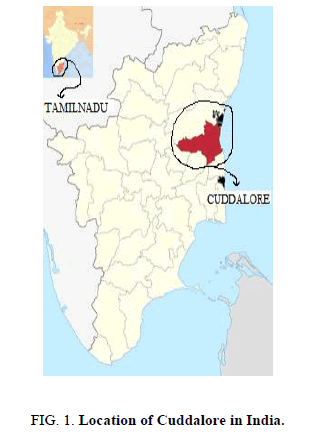 Figure 1: Location of Cuddalore in India. Figure 2: Location of areas in Cuddalore district. Table 1. Name of areas were samples taken. The chemicals used for quantitative analysis and all the solutions are prepared using distilled water. For pH meter, we have used the chemicals such as hydrochloric acid and sodium hydroxide. In electrical conductivity meter, the chemicals used are mixture of acids (acetic acid+hydrochloric acid) and sodium hydroxide. For testing the total hardness, we have used the EDTA method and the chemicals used are Ethylene Diamine Tetra Acetic acid (EDTA), indicator as Eriochrome Black-T (EBT) and buffer solution is ammonia buffer. For chloride test, we have used the Mohr’s Method and the chemicals are silver nitrate and indicator as potassium chromate. The following are estimation of various components present in the water samples can be estimated from the below descriptive methods. 20 ml of water samples is pipetted out into the conical flask, where the indicator (potassium chromate) is added into it and titrated with the 0.1 N silver nitrate solutions. The known amount of water samples was taken into the 100 ml beaker and titrated with the sodium hydroxide solution or it can also be measured by digital pH meter. The water samples are taken into 150 ml beaker and it can be measured by digital TDS meter, where the meter should be kept in distilled water [7-9]. 20 ml of mixture of acids and 20 ml of water is added to 100 ml beaker and titrated against the sodium hydroxide solution or it can be measured by digital conductivity meter. Take a 20 ml of water samples in a conical flask; add the Eriochrome Black-T (EBT) indicator and ammonia buffer solution is also added into a conical flask and titrate with 0.1 N Ethylene Diamine Tetra Acetic acid (EDTA) solutions (Tables 2 and 3). Finally, the end point will be changes from wine red colour to steel blue colour [10-13]. Table 2. Bureau of indian standards for drinking water specifications (IS: 10500-2012). Table 3. Values of various parameters taken during August 2016. Table 4. Values of various parameters taken during Sep 2016. This type of source can be polluted due to large land areas and hence the non-point source cannot get traced by the point of discharge. They can be avoided by taking some measures in and around the Rivers of Cuddalore district. Here the lagoons are used in many industries such as oil and gas production, fertilizers industry, mining industry and so on. Mostly, the lagoons are constructed with sealed bottom to prevent the seepage in the ground. Because of the construction in the ground, the spillage of chemical fertilizers will cause the well water to be polluted. Hence, the odor and taste of the groundwater is becoming poor. It also causes the overflows of chemicals into the groundwater (Table 5) [14,15]. Table 5. Values of various parameters taken during Oct 2016. The hazardous materials are nothing but the radioactive materials, gases or some other materials can affect the groundwater to be polluted. This can lead to the leakage of any materials within the soil particles and it will contaminate with the groundwater, it causes the water to be polluted. So, they can be prevented by making the environment clean and it should be disposed through drainage facilities [16-18]. Chemicals such as organic and inorganic wastes (brine, sulphates etc.,) are used in industries, farms and other industries. These types of chemicals are stored in tanks due to long days of storage; it is cracked and get leaked into the soils and contaminated with the groundwater. In many cases, the fertilizers which are used to kill insects are also getting contaminated with the soil of Cuddalore. In this source, the improper storage of chemicals like oil, gases and other petroleum products will cause the severe contamination of groundwater pollution. These may cause health problems in and around the consumption of groundwater in a daily life. Due to improper disposal of chemicals it causes the water to be polluted (Table 6). Table 6. Values of various parameters taken during Nov. 2016. Table 7. Values of various parameters taken during Dec. 2016. From the above table, the various chemical parameters of groundwater from different parts of our country are shown. BOD levels of water bodies in Maharashtra, Puducherry and Dindigul have similar values (i.e., from 20 mg/L to 180 mg/L) (I, II and IX) but in Karnataka region, the BOD range is very low (i.e., from 1.1 mg/L to 3.7 mg/L) and COD level is also at very narrow range (i.e., from 11.3 mg/L to 32.6 mg/L) (II and VII) which indicates the water is polluted at very high level and cannot sustain aquatic life. pH value in most of the regions of the water bodies are slightly higher than the optimal level (i.e., from 6.5 to 8.9) (II-VI, IX and X) but at Thuraipakkamdump yard, the pH is at 5.5 to 7 which shows basic characteristics of water which may leads to corrosion . DO values at Maharashtra and Puducherry are at optimal level (i.e., from 2 mg/L to 8 mg/L) (II and V) but at Dindigul, it is way below the optimal level (from 0.2 mg/L to 0.4 mg/L) (IX). EC at Bihar and Bangladesh are quite high (i.e., from 100 μs to 1970 μs) (IV and VI) as compared with Tamil Nadu. Some other parameters like chloride, turbidity and TDS where tested on Ambattur industrial area has given the pollutant contents in groundwater and its inability for the use of living beings (Table 8). Table 8. Areas of various groundwater chemical parameters in India. The values of various physical and chemical parameters in the Cuddalore district have been analyzed and studied during this period from August 2016 to December 2016 . During the month of August and December, the values in Muthalammankovil Street (i.e., Sample 3, from Tables 1 and 3) has shown that very low in chloride (mg/L) content and high in conductivity (μs) test, according to BIS parameters. By the month of October, the values of sample 1 in Pachchyankuppam (Tables 1 and 5) have shown very high content in TDS (ppm) and EC (μs). From this above discussion, it has seen that the taste and odour of groundwater in the investigated areas are not very pleasant and some other areas are not contaminated with the chemicals. Therefore, the usage of groundwater in the investigated areas should be discouraged. The cause for the contamination in the bore water (or) groundwater at Cuddalore district may be of seepage or sewage and some leakage chemicals. The study shows that the groundwater in the investigated areas is not fit for drinking water purposes. This water can be purified by various purification techniques. After purification, this can be sent to Cuddalore district so that the people can be free from some diseases. This experimental analysis may give sufficient information about the contamination in Cuddalore district ground water. The authors are thankful to Dr. V. Ramasamy, Principal, and Dr. S. Udhayavani, Department of Chemistry, Adhiparasakthi Engineering College, Melmaruvathur who has been a constant source of inspiration and supported us a lot through the research work. Bagul VR, Shinde DN, Chavan RP, et al. Causes and impacts of water pollution on Rivers in Maharashtra: A review. Res J Chem Environ Sci. 2015;3(6):1-5. Subba Rao MV, Dhilleswara Rao V, Andrews BSA. Assessment of quality of drinking water at Srikurmam in Srikakulam district, Andhra Pradesh, India. Int Res J of Env Sci. 2012;1(2):13. Mukherjee D. A review on artificial groundwater recharge in India, SSRG. Int J of Civil Eng. 2016;3:1. Anwar KM, Vanita A. Analysis of groundwater quality using statistical techniques: A case study of Aligarh City (India). Int J Tech Res App. 2014;2(5):100. Divya K, Vidya R. A review on tannery pollution in Vellore district, Tamilnadu, India. Res J Pharm, Biol and Chem Sci. 2016;7(3):1381. Anwar KM, Aggarwal V. Analysis of groundwater quality of Aligarh City, (India): Using water quality index. Current World Environment. 2014;9(3):851. Vijayakumar G, Sivasankaran MA, Murugaiyan V. Studies on the pollution levels in Ariyankuppam backwater, Puducherry region. Int J Sci, Env and Technol. 2012;1(5):363. Saravanakumar K, Ranjith Kumar R. Analysis of water quality parameters of groundwater near Ambattur industrial area, Tamilnadu, India. Indian J Sci and Technol. 2011;4(5):660. Jadhav SD, Sawant RS, Godghate AG, et al. Assessment of ground water quality of Ajara Tahsil from Maharashtra. Rasayana J Chem. 2012;5(2):246. Mohamed Hanipha M, Zahir Hussain A. Study of groundwater quality at Dindigul town, Tamilnadu, India. Int Res J Environ Sci. 2013;2(1):68. Sunitha V, Abdullah Khan J, Muralidhara Reddy B, et al. Assessment of groundwater quality in parts of Kadapa and Anantapur districts, Andhra Pradesh, India. Indian J Adv in Chem Sci. 2014;3:96. Neerja Kalra N, Rajesh K, Yadav SS, et al. Physico-chemical analysis of ground water taken from five blocks Udwantnagar, Tarari, Charpokhar, Piro, Sahar of Southern Bhojpur (Bihar). J Chem Pharm Res. 2012;4(3):1827. Venkatesharaju K, Ravikumar P, Somashekar RK, et al. Physico-chemical and bacteriological investigation on the River Cauvery of Kollegal stretch in Karnataka. Kathmandu Uni J Sci Eng and Technol. 2010;6(1):50. Arafath Y, Kumar P, Banupriya YA. Analysis of pollutants present in the ground water due to leachates at Thuraipakkam dump yard, Chennai. Civil and Environmental Research. 2014;6(6):55. VenkateswaraRao B. Physico-chemical analysis of selected groundwater samples of Vijayawada rural and urban in Krishna district, Andhra Pradesh, India. Int J Env Sci. 2011;2(2):710. Basic Information in Nitrates in Drinking Water, Basic information about Regulated Drinking Water Contaminants. US-EPA-Environment Protection Agency. 2012. Borah BK, Sarmahand HP, Roy R. National Environmental and Pollution Technology. 2011;10(1):73. Elangovan NS, Dharmendira kumar M. Assessment of groundwater quality along the Cooum River, Chennai, Tamil nadu, India. Hindawi Publishing Corp. J Chem. 2013;1. ISI Indian standard Drinking Water Specifications, New Delhi. 1991;5:16. Ramesh K, Thirumangai V. Trace metals contamination of groundwater in and around tannery industrial area of Pallavaram, Chennai City, India. Int J Res in Eng and Technol. 2014;3:163. Bhattacharya P, Jacks G, Ahmed KM. et al. Arsenic in ground water of the Bengal delta plain aquifers in Bangladesh. Bulletin of Environ Contam and Toxicol. 2002;69:545.
WHO guidelines for drinking water quality. World Health Organization, Geneva. 2008.